40" x 14" x 9.25"
The squinting eyes, maniacal grin and great bulging cheeks of this extraordinary face mask burn haunting images in the mind's eye. 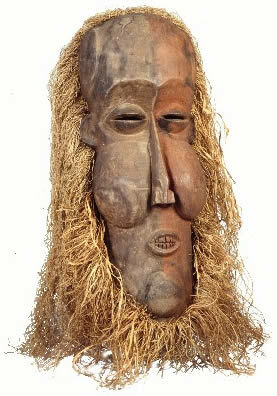 The type of mask shown here is one of two masks used in male initiation rites, fertility dances, and festivals. Due to its substantial size it is considered to be the Kukunga or male dancer. Its female counterpart is called Kaseba. The orange-red paint, tukula, embellishing the mask is made from a local root.